Do You Know These 9 Obscure Saints with January Feast Days? The Church celebrates the feast days of many well-known saints in the month of January. Saint Basil, Saint Elizabeth Ann Seton, Saint John Neumann, Saint Brigid, and Saint Agnes are just a few of the house-hold saint names that appear on the liturgical calendar. But what about the unknown saints, those who slip by unnoticed? Here are nine saints who you may not recognize. Get to know them during the month of January! The daughters of King Lagohaire, these princesses were the first converts of Saint Patrick in Ireland. Tradition holds that the two girls desired to see God, but Patrick told them they would have to wait until after death. When Patrick gave them their first communion, the two young girls died of longing for the Lord. The Church celebrates their feast day on January 10. Vitalis is the patron saint of prostitutes and day-laborers. When he arrived in Alexandria at the age of sixty, he gathered the name and address of every prostitute in the city. During the day, Vitalis hired himself out as a day-laborer. But when night came, he would pay for an evening with one of the local prostitutes. Instead of using her, he would teach her about her dignity as a daughter of God. A man killed Vitalis when he misunderstood the reason a monk was visiting local brothels. During his funeral, former prostitutes that he had converted to the faith created a funeral procession. In the Eastern calendar, his feast day falls on April 22. In the Catholic Church, Vitalis is remembered on January 11. Margaret is the patron saint of people rejected by religious orders. She herself experienced rejection from two convents in France before undertaking a teaching apostolate in Canada. In Canada, she founded the Sisters of Notre Dame, a group of women dedicated to the teaching and formation of young women. The Church honors Margaret on January 12. When Vincenza was young, she was inspired by her aunt and took a vow of chastity. The daughter of a lawyer, she refused the arranged marriage her parents had in mind. In 1876, when she was twenty-nine years old, she founded the Daughters of Mary Immaculate. The order’s mission was to protect vulnerable young women who worked in Spain as domestic servants. Only two years after the foundation of the order, Vincenza died after an intense illness. The Church celebrates her feast day on January 18. Wulfstan was a bishop and reformer from England. He joined the Benedictines, and was named Bishop of Worcester in 1062. Although he doubted his ability to serve as bishop, he proved to be incredibly capable of the leadership position. He was the only bishop to be kept at his post by William the Conqueror. Wulfstan spent the next thirty years rebuilding churches and caring for the poor. Tradition says that Wulfstan was distracted from prayer one day by the smell of a roast goose cooking for dinner. He immediately decided to give up all meat for the rest of his life, and today is honored as the patron saint of vegetarians. The Church remembers Wulfstan on January 19. After the death of Pope Anteros in 236, Fabian journeyed to Rome as a layperson. Imagine the shock of everyone (including Fabian!) when a white dove settled on Fabian’s head during, an indication of the descent of the Holy Spirit. Everyone present declared that Fabian was worthy to be the first pope, and Fabian was declared pope. He reigned during a time of peace for the Church, but peace ended when Emperor Decius took the throne. Even though many Catholics didn’t stand up against Decius, Fabian took a strong stance against the pagan rituals Decius urged everyone to participate in. Fabian died a martyr in 250, and a stone slab with Fabian’s name can still be found in the Cemetery of Calixtus. The Church celebrates Fabian’s feast on January 20. Nothing much is known about this sixth century saint from Wales. 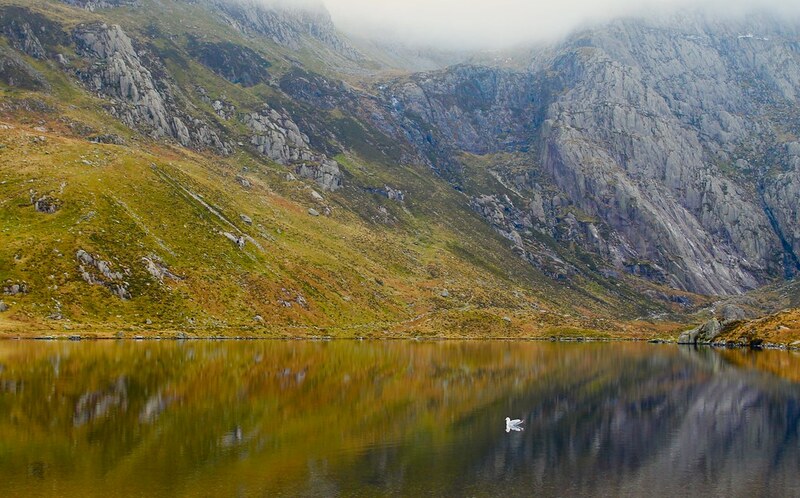 He is the patron of four churches in the diocese of Saint David’s in Wales. He also founded a monastery. Despite the minimal information left about Lawdog’s life, his story is an example of how we are all called to holiness, even if history forgets the details of our lives. The Church celebrates Lawdog on January 21. 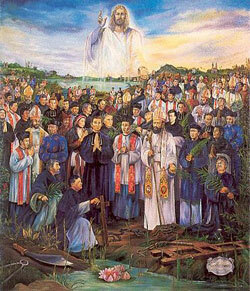 Matthew was a Dominican martyr of Vietnam. Born in Spain, he discerned a call to religious life and became a Dominican priest. Matthew’s first assignment was to the Philippines, but the Dominicans later sent him to Vietnam. He was beheaded during a period of Christian oppression and persecution. Pope Saint John Paul II canonized Matthew in 1988. The Church remembers the courage and faith of Matthew on January 22. 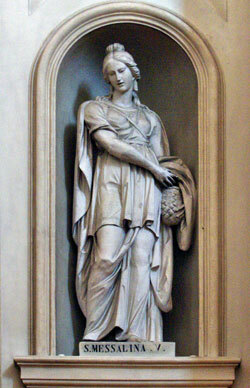 Messalina was a student of Saint Felician. She discerned a call to religious life and received the veil from Felician. When Felician was imprisoned during a time of persecution in the Church, Messalina visited him. Her visits caused some to suspect she had converted to Christianity. After a trial, Messalina refused to sacrifice to the pagan gods. When she refused, guards beat her to death in the year 251. Her relics are enshrined in the chapel of Our Lady of Loreto in Foligno, Italy. The Church celebrates Messalina’s courage on January 24.